If you are simply looking for ways to measure carbon footprint, this article may not help you (yet). However, if you are an organisation that believes in a sustainable environmental approach;if you are concerned about CO2 emissions, your impact on the Natural Capital, and sustainability of your supply chain; if you are want to embed environmental and sustainable thinking into the way you think and act as a business; if you want to design an environmental balanced scorecard that communicates and supports such thinking and action, then read on…. There are several mistakes you can make when designing environmental balanced scorecards, however there is one in particular we want you to avoid. If you are designing or deploying an environmental scorecard, this mistake will cause you to waste time, will undermine your sustainable intentions and lead you to miss a real opportunity to improve. 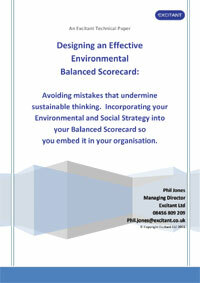 The mistake is this: simplistically adding an “environmental perspective” to your organisation’s balanced scorecard. Let me assure you that it will not work. It will create more problems than it will solve and it will undermine your environmental credentials. To avoid this mistake, our white paper, “Designing an effective environmental balanced scorecard” (available for download at the bottom of this page) explains how to correctly incorporate sustainable environmental measurement and thinking into a modern balanced scorecard. It provides examples of various environmental strategy maps and balanced scorecards. It explains how to represent various environmental and sustainable strategies, so you can monitor their implementation and effectiveness. Today, organisations want to embed sustainable, environmental thinking into the way they work. They want to avoid superficial “green-wash”. They want to make a difference. They also want an environmental reputation, but one that comes from their values, behaviours, and culture, rather than simple claims of environmental impact. They want to be able to demonstrate their environmental and social credentials. It can make a significant impact on how customers perceive the organisation and how markets and investors value the organisation. It is important to the people who work there as well. Yet many make a basic mistake when incorporating environmental reporting into their balanced scorecard. They simply add an environmental perspective to their scorecard. 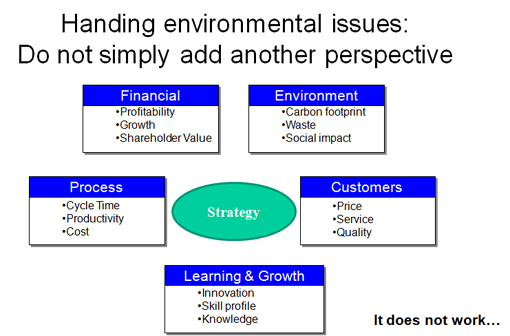 The simple logic seems to argue for a dedicated environmental perspective in the balanced scorecard. It appears to addresses Kyoto, environmental legislation, and its demand for management reporting. It seems obvious to add an extra environmental perspective, alongside your other perspectives, in your balanced scorecard as shown in figure 1 (below). Everything associated with environmental and sustainable thinking is now isolated in a separate perspective, rather than them being a part of what everyone does. It divides, rather than integrates. Environmental issues are separated. It focuses attention on environmental impact, carbon footprint, but it fails to address the drivers and enablers and thinking behind the environmental or social impact. It tells you the result, but not what to do about it, how to do it, or why? Environmental scorecards – Can’t I simply add an environmental perspective? Adding a simplistic environmental perspective undermines your sustainability and your environmental credentials. Instead of focusing attention on environmental thinking, capability and action, it undermines them. This creates precisely the opposite effect to the one you originally intended. The same is true when you are dealing with corporate social responsibility (CSR). Do not simply add extra categories to create an environmental balanced scorecard. 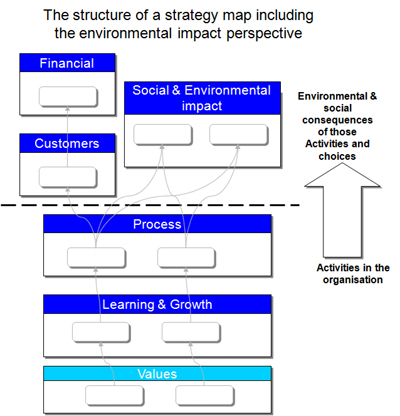 It was back in 1998 when we first included environmental thinking into a client’s strategy map and balanced scorecard. Since then we have included aspects on environmental and social impact, reporting and management in a variety of ways, depending upon the client’s situation, needs and strategy. Since then we have refined and developed our approach to accommodate all sorts of environmental and social responsibility approaches, as environmental thinking, responsibility and reporting demands have developed. When you download the paper you will see that the answer is to use the environmental perspective to only capture environmental impact. Environmental impact captures the consequences of the organisation’s actions. As figure 2 (below) shows, You should capture the causes, enablers and drivers in the lower balanced scorecard perspectives (Process, Learning and Growth and Organisational Values). These are where you describe and embed responsible, sustainable thinking, behaviours and activities into your organisation. Together these tell the story of your strategy for environmental and social responsibility. They provide the basis from which you communicate, monitor and manage this aspect of your organisation. The Four types of environmental impact to consider. Managing progress as well as the consequences.